Sorrell, Neil; Narayan, Ram (1980). Indian Music in Performance: a practical introduction. Manchester University Press. ISBN 0719007569. ^ Bor, Joep (March 1, 1987). 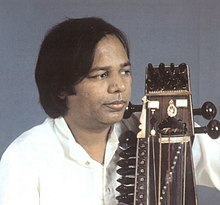 “The Voice of the Sarangi”. Quarterly Journal (Mumbai, India: National Centre for the Performing Arts) 15, 16 (3, 4; 1): p. 148. ^ Sorrell, Neil; Narayan, Ram (1980). Indian Music in Performance: a practical introduction. Manchester University Press. p. 11. ISBN 0719007569. ^ Qureshi, Regula Burckhardt (2007). Master musicians of India: hereditary sarangi players speak. Routledge. p. 108. ISBN 0415972027. ^ a b Bor, Joep; Rao, Suvarnalata; Van der Meer, Wim; Harvey, Jane (1999). The Raga Guide. Nimbus Records. p. 180. ISBN 0954397606. ^ a b c Neuhoff, Hans (2006). “Narayan, Ram”. In Finscher, Ludwig (German). Die Musik in Geschichte und Gegenwart: allgemeine Enzyklopädie der Musik. 12 (2nd ed.). Bärenreiter. pp. 911–912. ISBN 3761811225. ^ Bor, Joep; Bruguiere, Philippe (1992). Masters of Raga. Berlin: Haus der Kulturen der Welt. p. 48. ISBN 3803005019. ^ Roy, Ashok (2004). Music Makers: Living Legends of Indian Classical Music. Rupa & Co.. p. 206. ISBN 8129103192.